Winter break is coming soon – don’t wait to experience everything Philly has to offer this holiday season! Celebrating in Philly means lights, food, and special events everywhere. To make sure you don’t miss a thing, Campus Philly has curated 6 of the best things you need check out this holiday season, from ice skating to scuba-diving Santas! Pull on the skates and pick up some holiday joy! Dilworth Park, right next to City Hall, is the place to be every night throughout the holidays. 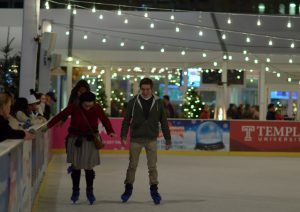 Ice skating is open now through February 24 on the Rothman Orthopaedics Rink where you can rent some skates and hit the rink for only $15 (tip: get a dollar off with your SEPTA Key). Gather your friends (or maybe a date?) and kick off the holidays. Want to give something special to your friends and family while supporting Philly? The Made in Philadelphia Holiday Market opens November 17 and runs through January 1 featuring Philly artists, designers, and crafts from over 40 vendors. The Deck the Halls Light Show kicks off on November 19 and runs through January 1. The twinkle lights in your dorm are great, but these lights scale City Hall with light shows every hour (or thirty minutes on select days). Also at Dilworth Park, enjoy cocktails and holiday drinks (21+) at the Rothman Orthopaedics Cabin, visit the Wintergarden, and check the calendar for other winter events like Quizzo, College Nights, and Santa Express. With the holiday sweets and treats hitting the shelves, Reading Terminal Market is the place to pick up (and discover) all the greatest holiday foods. You’ll get lost in a maze of winter delights, and chances are you’ll walk out with a full stomach and some leftovers to take home. Our suggestions are a couple doughnuts from Beiler’s Doughnuts and some whoopie pies from Flying Monkey Bakery. Kick off the holidays in the historic Old City beginning November 29th from 5:00-7:00 p.m. The kick-off celebration will take place in the Betsey Ross House courtyard (239 Arch Street). But wait…there’s more! 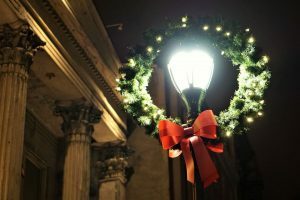 Celebrate all season in Old City with pop-up holiday markets, frequent Santa visits to the Firehouse Museum on Saturdays and Sundays, and the neighborhood window decorating contest. Philly residents celebrate the season better than anyone else! 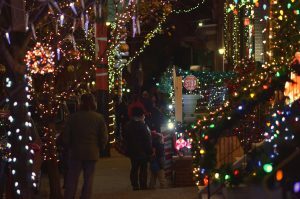 Take a stroll through South 13th Street, between Tasker and Morris Streets, and enjoy the residential lights that will brighten the city beginning November 24 and up until New Years Day. Lights will be on every day between 5 p.m. and 12 a.m. Climb up the famous steps from Rocky and get a glimpse of the huge Christmas tree waiting for you at the top. Want to see it light up? Join the museum on November 21 at 5 p.m. to enjoy the Christmas tree lighting, then explore the museum for pay-what-you-wish admissions afterward, and every Wednesday, between 5 p.m.-8:30 p.m. Stop by to see the tree throughout the entire holiday season. Check out their full schedule for more ways to celebrate the holidays of the museum! Did you know Santa’s a scuba diver? At Adventure Aquarium right across the river in NJ, explore the underwater world with Santa and his elves. Watch the sharks as they swim around the world’s largest underwater Christmas tree. Keep on the lookout for when the Santa will be diving into the tanks this December! Show your SEPTA Key for $4 off admissions. For more holiday events in Philly, and the best things to do year-round, keep checking the Campus Philly Calendar where we curate the most relevant Philly events you (and any college student) will love. Let us know how you’re spending your holiday season – tag #CampusPhilly on Instagram and we might just feature your photo! Happy Holidays from Campus Philly! Next PostNext Part 1: What’s Your Philly Story?